The global robot operating system market is anticipated to grow at an exponential rate, according to a report by Transparency Market Research. Top six vendors in the market are ABB Ltd., Clearpath Robotics, Omron Adept Technologies Inc, iRobot Corporation, Kuka AG, and Stanley Innovation, who are continuously investing in research and development activities, thus balancing the supply-demand chain. Companies like ABB and Faunc Corporation are looking forward to invest more on research and innovation, in order to make quality robots and a better ROS. These organizations are expanding geographical footprints by collaborating or acquiring local company in order to reach to the target customers. These expansion of these major players are providing a lucrative demand for ROS market. It is anticipated that the healthcare industry to boost the growth of the ROI market under the commercial and industrial sectors. Healthcare sector is expected to push the growth of the market. Geographically, Asia Pacific has shown an impressive growth in robots, both in volume and robots. Countries such as Japan, Thailand, and The republic of Korea manufacturing commercial and industrial robots both in high volume and is expected to show in years to come. The global robot operating system is anticipated to rise with a CAGR of 8.8% during the forecast period which is from 2018 to 2026. During this period the market is envisaged to reach US$402.7 mn. Factors such as adoption and funding in research and development activities is expected to drive the global ROS market. Rise in need of hardware and software which are easily adopted in research work and at considerable low amount is trying to boost the growth of the market. ROS helps in reducing the complexities of while developing robotics projects. Other factors such as the increase in speed during the software development process by ROS is considered as one of the major reason behind the upswing of the market. These days, healthcare facilities are showing interest in robotics, by bringing robots in operation theatre. Robots have already gained the trust of patients and doctors, and is expected to continue growing in future. Commercial robots have seen a surge in the inflow of funds, in order to develop a user-friendly operating system. 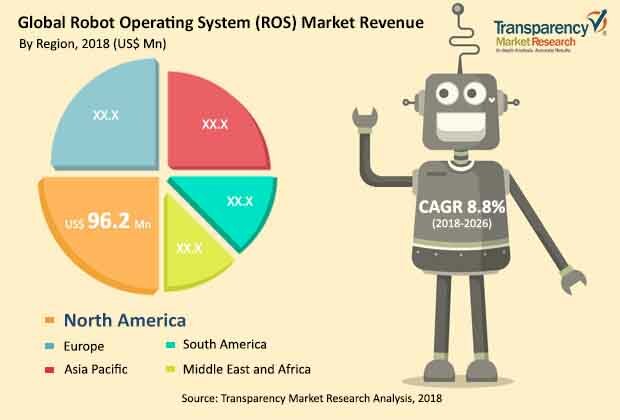 The ROS market is witnessing a surge in installation and deployment of commercial and industrial robots throughout the world, is pushing the market growth during the forecast period. It is anticipated due to these factors, that there will be more than 1.9 million of robots all around the world, due to its flexibility and user friendly nature. The market is known to see a rise in the demand for customized order. Robot making organization can easily pull out the required code from the web and can provide with the customized robots or ROS.